What Tyre Speed Rating Do I Need For My Car? If you’ve ever taken a close look at the outer wall of the tyres on your car, somewhere around it - apart from the manufacturer’s name and logo - you’ll have noticed a jumble of numbers, letters and symbols. 14 - shows the diameter of the rim of the wheel to which the tyre is fitted - although, confusingly, this is given in inches! But after this comes two other sets of characters. The first will be a two-digit number, which is what’s called the ‘load index’. Broadly, this is the maximum safe weight (in kilograms: 1kg = 2.2lbs) the tyre is designed to carry when in everyday use. However, it’s the very last of all these characters that we’re concerned with here - and that’s what is known as the speed rating. OK, while that’s fairly typical wordy legalese, it basically means that the weight transmitted to the road surface (again, in kilograms, see earlier for formula to convert into pounds) by any vehicle through its tyres can’t be more than that figure which comes before the final letter. That total weight also includes all of a car’s occupants and their luggage. These letters are intended to show the top speed a tyre is capable of maintaining over a sustained distance. To determine the speed rating of any new tyre design, engineers will test it at each 10kph (6.2mph) increment for 10 minutes, and give it a rating according to how well it performs within those parameters. The speed rating is also related to the hardness of the rubber compound from which tyres are made - it follows that harder tyres can withstand regular use at higher speeds. So you’ll need tyre with completely different ratings on your Bugatti Veyron than you would on your Ford Ka, to take an extreme example. The tyres fitted to most modern family cars will fall into a narrow band somewhere between R and H on the above scale, and even for a small city car such as a Volkswagen Up! the manufacturer will recommend fitting tyres rated somewhere in the middle of the scale. If you’re in any doubt, you’ll find any specific speed rating recommendations offered by your manufacturer in your car’s handbook - but there are websites which let you search for this information too. 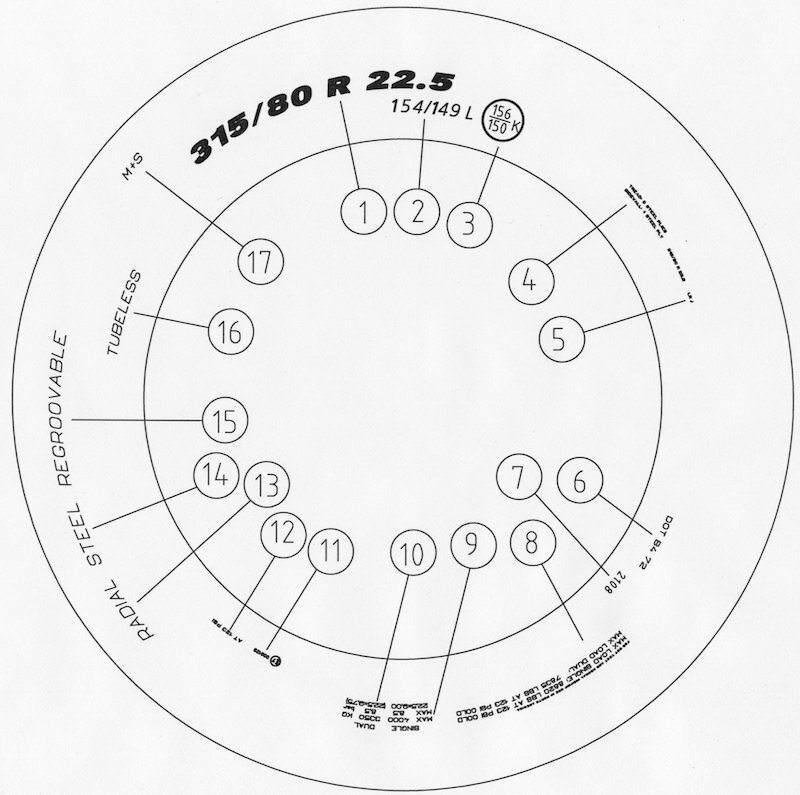 While we’re still, at the time of writing, part of the European Union, you may be comforted to know that all tyre markings are standardised across Europe, thanks to the efforts of the European Tyre and Rim Technical Organisation (ETRTO), which has operated for 50 years to help bring different national standards into alignment, and promote the sharing of good practice between manufacturers. Armed with this information, you should be able to decide whether a particular tyre which you see advertised will be suitable - and legal - for use on your vehicle. As you’ll see from the figures above, a one-letter difference usually equates to a 6mph/10kph incremental maximum speed rating (larger above 130mph). When shopping for new tyres, the variety of brands and prices can be bewildering, but you should always try to pinpoint the speed rating, and make sure that this matches, or ideally, exceeds by a comfortable margin, the maximum speed your vehicle is designed to do. Importantly, it doesn’t matter if you say “but I’ll never travel at (say 112mph), so I’ll buy a tyre with a lower speed rating” - if you’re caught and found with such tyres on your car, you could face a fine under the construction and use regulations for motor vehicles. But more likely, and probably a more immediate worry, is that your insurer could deem you to have breached the terms of your policy, whereby you undertake to use the vehicle safely at all times. Given that insurers load their policies with fine print, and will use this to check that any car subject to a claim doesn’t violate the regulations mentioned above before making any payout, you can expect your tyres to be checked as part of any examination by your insurer. How Do I Stand When It Comes To My Insurance? This is a bit of a moot point, but it’s generally thought that, if you fit tyres with a speed rating lower than your car’s top speed, it could be give your insurer a reason not to pay out in the event of a claim. This forum thread on the Honest John website explores the issue in more detail - if you’re in any doubt about the speed rating you need on your car, you can also use a tyre finding service, linked to the DVLA database. You’ll find one on some tyre retailers’ websites. These pinpoint the make, model and engine size of every registered vehicle. You can then use this to discover the right speed rating you will need for any replacement tyres. From an insurer’s point of view, they argue that fitting tyres with a higher speed rating than a car’s top speed helps ensure that those tyres can deal with higher acceleration loads and the stresses of higher speed cornering, even if the maximum speed isn’t exceeded. Some tyre organisations offer vehicle registration number (VRM) tyre-finder services, which will automatically choose the correct tyres, with the right speed rating, for your car. On the other hand, some retailers may just offer you the tyre size you ask for, and it could be down to you to check whether they have taken the trouble to also find a tyre with a speed rating that’s appropriate for your car. In short, it’s a good idea to have a separate, written note of all the information about your tyre size, type and speed rating away from your car handbook, just in case you mislay this, or need to find it quickly when you’re not in the car. To find quality tyres at the right price, you can register with MyCarNeedsA.com, input details of what you’re looking for, and then get quotes for supply and fitting from our service providers - saving you the time and trouble of shopping around and comparing prices yourself.